The Rolling Stones are to play Twickenham Stadium on Tuesday 19 June. The band are back where they belong on home turf with a number of massive UK concerts in May and June plus others confirmed for Ireland, France, Germany, Czech Republic as well as Poland. 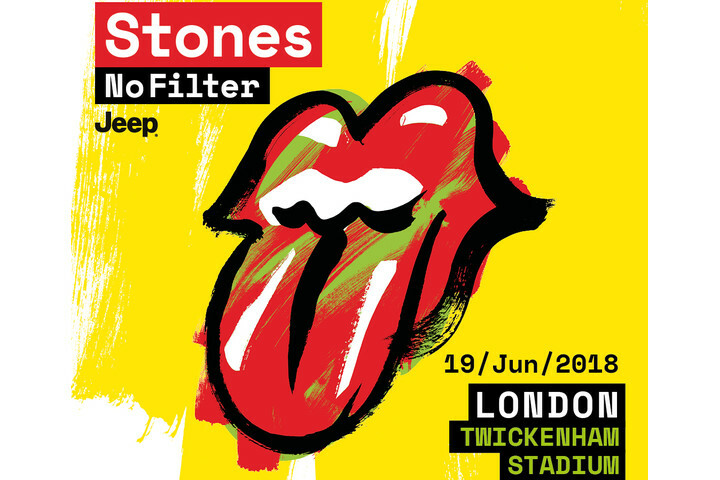 Part two of the 'STONES - NO FILTER' tour, sponsored by Jeep®, sponsor of The Rolling Stones european tours since 2014, sees Mick Jagger, Keith Richards, Charlie Watts and Ronnie Wood continue on from their hugely successful sold out European trek in the autumn of last year. The Rolling Stones will treat fans to a set list packed full of classics such as 'Satisfaction', 'Paint It Black', 'Tumbling Dice' and 'Brown Sugar' but each night they will include a couple of unexpected tracks as well as randomly selected surprises from their formidable arsenal of songs. As always when the Rolling Stones come to town they will bring a spectacular production and state of the art stage design. "It's such a joy to play with this band there's no stopping us, we're only just getting started really," said Richards. Jagger added: ''This part of the 'No Filter' tour is really special for the Stones. UK shows go on general sale at 9am GMT on Friday 2 March, while in the UK, an American Express® pre-sale will run from 9am on Wednesday 28 February to all American Express Card members. For more info please visit axs.com/amexpresale. "Music makes me happy, and it makes them happy…it's infectious." A limited number of VIP packages will be available for purchase. Package offerings can include an amazing selection of tickets - including tickets in the ultra-exclusive No Filter Pit - limited-edition lithographs, custom VIP merchandise, and much more. Fans can also enjoy a variety of travel packages that will be available in all cities while support acts will be announced at a later date. "When I look out at the sea of people when we play all I can see is smiles," said Wood. "It's heart-warming and I'm glad we make people happy. Music makes me happy, and it makes them happy…it's infectious." The Rolling Stones last played in the UK in the summer of 2013 with their unforgettable Glastonbury headline show on the Pyramid Stage, followed by two sensational shows in London's Hyde Park where they played to a sold-out crowd of 65,000 fans.